I was again reminded, by the recent passing of esteemed golf course architect Geoffrey Cornish, of just how integral the act of walking is to the practice and perception of golf course design. Mr. Cornish died at his home in Amherst, Mass. on Feb. 10, at the ripe old age of 97. Much has already been written about him, in golf circles, though maybe not so much about his work. Every day, right up until the very end of his long life, Mr. Cornish walked/hiked the nearby Lawrence Swamp. Many a tale was related this week about younger men struggling to keep up. For a guy who designed more than 200 golf courses over the course of a 70-year career, and was known and loved by nearly everyone, it seemed an odd thing to fixate upon. I grew up in New England and have lived here pretty much my entire adult life, so I’ve probably played close to 75 of the 200-plus courses credited to Geoffrey Cornish. Still, his design work is difficult to assess, and in detailing why that is, we get a fuller picture of the man — and why he was such a beloved and unique figure. For starters, Mr. Cornish, though Canadian born, was a frugal Yankee on a par with all too many of his clients. He was the anti-signature architect, if you will, often taking jobs with small budgets, on land of questionable golfing value, and making from this the best course he could — one that might be efficiently maintained. (He was trained as an agronomist, after all.) It should come as no surprise that few men designed more municipal tracks than Mr. Cornish (the solid Chicopee Muni in Western Mass., pictured above, is but one example). Consider the vast number of 9-hole courses where he added new nines, or the rudimentary courses he renovated and/or formalized. I can think of several examples of real dog tracks that Mr. Cornish made whole, and wholly improved, with his renovations and 9-hole expansions. They are today understood to be “Cornish designs”. But it must be said that an architect more concerned with his signature, his reputation, might not have even taken these jobs. But Mr. Cornish could turn down no one. By the same token, this mixing and matching of his work with that of others tends to muddy evidence of his design skill. In the late 1950s at Wahconah CC in Dalton, Mass., Mr. Cornish added nine to a spectacular original loop laid out in the 1930s by Wayne Stiles. The newer work frankly pales in comparison. However, at Brunswick (Maine) GC, Mr. Cornish did essentially the same thing and his nine — some of his very best work — is certainly equal to that of the Stiles nine, maybe better. In neither case does there seem to have been an attempt on Mr. Cornish’s part to carry on Stiles’ style from the original holes. I’m not sure what that means… Just figured I’d throw it out there. In writing the previous paragraph, I confirmed and dated design credit for both Wahconah and Brunswick by consulting my copy of The Architects of Golf, a veritable tome that Mr. Cornish first compiled, in the late 1980s, in partnership with Golf Digest Architecture Editor Ron Whitten. The Architects is a hard book to describe. For starters, it’s encyclopedic in size and scope, a compilation of all the golf courses on Earth that also catalogs all the architects who designed them, and when. It’s all cross referenced and complemented by mini biographies on the hundreds of folks who’ve pursued this craft since the late 19th century. It was, when it came out, and remains an extraordinary research achievement and resource. Of course, its very recognition and sober celebration of so many architects, many of them contemporaries of his in the design field (and competitors), again shows how little Mr. Cornish cared for his own aggrandizement. Mr. Cornish’s propensity to team up with people, as he did with Whitten, on projects design-related and otherwise, again displays his utter disinterest in the spotlight. This is laudable in any human being but quite extraordinary in the golf course design realm. Here again, it tends to diminish or obscure his architectural legacy. Two of Mr. Cornish’s best and best-known designs are the North and South courses at Stow Acres CC in Central Massachusetts. But he designed them both during his 13-year partnership with Bill Robinson. 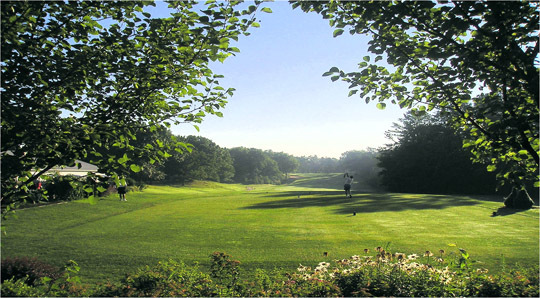 Ditto for the lovely 36 holes at Bretwood in Keene, N.H., Manchester CC and Quechee Lakes in Vermont, and dozens of others. In assessing them, one wonders whose work this was because Mr. Cornish was always working with someone. Even his nine at Wahconah was designed with Rowland Armacost (or so I was reminded by consulting the book he produced, with Ron Whitten). Robinson would leave the firm and relocate to the Pacific Northwest in the late 1970s. Shortly thereafter Mr. Cornish brought in another young partner, Brian Silva; in the 1990s, Mark Mungeam made three. Assigning individual design credit within a course architecture firm is always a difficult business and, in this case, it cuts both ways. Mr. Cornish was not a golfer — yes, you read that right. He didn’t really play the game and some of his earlier work (pre-1980) is marked by awkward elements: doglegs that bend in just the wrong place, landing areas that aren’t up to the task, etc. It’s easy to chalk this stuff up to his non-golfer status, or the fact that he designed that particular course for a song (in a swamp). But truly, who takes responsibility for the good and the bad: Robinson or Cornish or Armacost or the owner who finished the course himself because he ran out of money? In the case of Geoffrey Cornish, it’s hard to know. This sort of determination is made even more difficult by the fact that Mr. Cornish never had a bad word to say about anyone. My firm handled media for Cornish, Silva & Mungeam for many years starting in the late 1990s, and Mr. Cornish and I often chatted casually re. the various design attributes of certain holes attributed him over the years. Bill Robinson got nothing but praise. 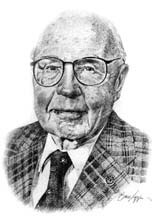 At one point in the 1990s, when there was a spate of golf books being published on “great” architects, I got a notion to write one on Stanley Thompson, for whom Cornish first worked as a young soil scientist during construction of Vancouver’s famed Capilano GC — in 1935! I mean, here was a walking, talking, living, breathing link to the Golden Age of Golf Course Design — and to Thompson, one of the game’s all-time talents, characters and rogues. I remember getting on the phone with Mr. Cornish and talking to him about The Toronto Terror one afternoon. He spun a few dry but entertaining, admiring yarns highlighting Thompson’s propensity for drink, his canny freewheeling ways on and off the course site. It was gold. Pure gold! But when I told him of my grand plans, Mr. Cornish demurred. He couldn’t possibly provide these stories for publication. I believe he used the word “untoward”. I suppose I could attempt to recount those stories here, but Mr. Cornish clearly didn’t want to be the purveyor of gossip. At this stage especially I’m loath to go against his wishes. Needless to say, the book idea proved dead on arrival. I chaired a golf conference back in the mid-1990s during my tenure as editor of Golf Course News. The inimitable Pete Dye was the keynote speaker and I introduced him. Someone during the Q&A period asked him about how he dealt with all these “environmental activists” sticking their noses into his various projects. I’ve always liked that story. It’s apropos of what I learned from working alongside and writing about so many golf course architects these last 20 years: Walking is a big part of what they do. When they arrive on a virgin site, they walk it for weeks — routing holes, evaluating the land’s rise and fall, noting what may or may not have to be graded, where the natural green sites might be placed, how to link them up effectively, and which flora/fauna will need to be avoided/preserved. I’ve been on quite a few of these preliminary site walks and they’re often as fascinating as they are physically invigorating. It’s the same drill when they are building or refurbishing a layout — why ride around a course under construction, or renovation, in a cart? You gotta walk the holes, approaching these still-developing greens, bunkers and tees from the ground, as a golfer will encounter them. It’s important to remember that this is exactly what Geoffrey Cornish did (always in jacket and tie, mind you) for six-plus decades, as he designed, expanded and renovated golf courses all across New England, the Northeast and Eastern Canada. He walked. In the early 1990s, when he stepped away from everyday design duties, he just kept on walking. Only last week did he stop. Lovely, Hal. I’ve read lots of Cornish tributes in the last week. That’s one of the nicest. Very nice, Hal. The material from Silva is especially moving and, in my experience with Cornish, exactly right. I put up my piece on Cornish here on The A Position: bit.ly/yBFVfn and I certainly emphasized the walking, right in the title. But it was mainly because he always made such a big thing about it himself–less as something a golf course architect naturally does, more as a way of explaining his excellent health at an advanced age! I recently heard from Ron Whitten that he has revised “Architects” material on a huge data base, but can’t find a publisher! Thank you for writing this wonderful remembrance of a true gentleman. A better friend of the game, and those who have made it great the last half-decade, there has never been. A true friend who always went out of his way to stay in touch. There was a lot to learn from him.